Miranda Lambert accepts the Female Vocalist of the Year award on stage at the 48th annual CMA Awards at the Bridgestone Arena, Nov. 5, 2014, in Nashville, Tennessee. It was a big night for Miranda Lambert at the 48th annual Country Music Association Awards, presented Wednesday night in Nashville, Tennessee. Lambert went into this year’s Country Music Association Awards race with nine nominations, more than any other contender. The 30-year-old superstar took home the night’s first trophy, Single of the Year for the song “Automatic.” She also beat out Luke Bryan, Dierks Bentley, Eric Church and Keith Urban in the Album of the Year category for “Platinum.” Lambert collected her fifth consecutive Female Vocalist of the Year trophy, passing Reba McEntire and Martina McBride for most wins in that category. While accepting the award, she spoke about being a role model for other female singers and songwriters in Country music. Lambert shared her fourth CMA Award with Urban. Their duet “We Were Us” won for Musical Event of the Year. The Song of the Year statue went to Kacey Musgraves for her Top 10 Country hit “Follow Your Arrow.” Kacey explained to the audience what makes a Country song relevant to listeners. Blake Shelton poses in the press room with the award for Male Vocalist of the Year at the CMA Awards, Nov. 5, 2014, in Nashville, Tennessee. 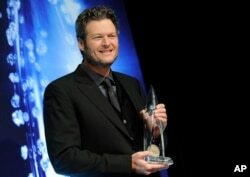 The Male Vocalist of the Year award went to Blake Shelton for the fifth year in a row. Shelton gave special thanks to an artist who has never won a CMA award that he credits as one of his biggest musical inspirations. Other winners included Brett Eldredge, named New Artist of the Year; Little Big Town, Vocal Group of the Year for the third consecutive year; Florida Georgia Line, Vocal Duo of the Year for the second straight year; Dierks Bentley, Music Video of the Year for “Drunk On A Plane;” and guitarist Mac McAnally, who took home his sixth consecutive CMA Award for Musician of the Year. Also during the live telecast, legendary singer-songwriter Vince Gill was presented with the Irving Waugh Award in recognition of his “historic impact on Country music.” The award has only been given out once before, to the late Johnny Cash. Luke Bryan accepts the award for Entertainer of the Year onstage at the 48th annual CMA Awards in Nashville, Tennessee, Nov. 5, 2014. Luke Bryan won his very first CMA Award, the night’s top honor, Entertainer of the Year. In an emotional speech, Bryan thanked his late brother and sister and the many fans who support him.